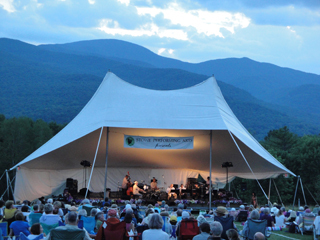 This has been a spectacular summer here in Northern Vermont and the Stowe area. It has been a little dry, however, that weather has lead to more opportunities for outdoor activities than ever! Mountain biking trails have been open more often than not and the lakes and rivers have been as welcoming as ever for canoeing, kayaking and swimming. Summertime parties, reunions, weddings and outdoor concerts have all enjoyed warm weather and blue skies. Even the local farmers have been able to hay their fields on their timetable rather than that of Mother Nature's. As September approaches, although we feel a little more "crisp" in the air and we are starting to see a little bit of color creeping into the hills, we know there is still more excellent weather left ahead to enjoy.